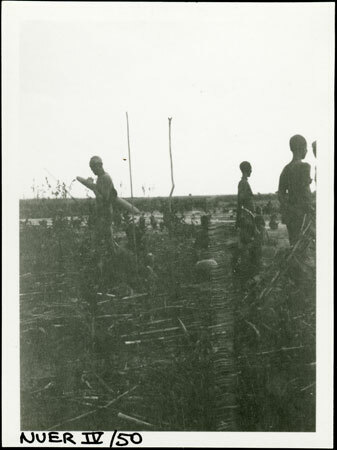 A dark image at sunset of a group of men gathered near a colwic shrine, visible as a pole with a forked top, sacrificing an ox for the spirit of a girl killed by lightning called Nyakewa. This event was witnessed by Evans-Pritchard in 1936. The colwic shrine, consisting of an mound of earth surrounded by offerings of tobacco with a sapling of the nyuot tree planted in the centre can be seen in other images, probably taken the next day. Nyakewa was considered to have become a colwic, a spirit taken directly by God. This specific intervention by the divine was considered so dangerous to all associated with the deceased that sacrifice is made by all relatives, and a special shrine erected with offerings. Note on print reverse ms pencil - "4 W. Nuer" & print front border ms ink - "NUER IV/50"
Morton, Chris. "Nuer colwic ceremony" Southern Sudan Project (in development). 03 Jan. 2006. Pitt Rivers Museum. <http://southernsudan.prm.ox.ac.uk/details/1998.355.173.2/>.